KIEV, Ukraine -- While we see a great deal of media coverage of Ukraine-related geopolitical risks, there hasn't been sufficient discussion about the dire economic and fiscal conditions the nation is facing. Writing about men in masks fighting in eastern Ukraine sells far more advertising than covering the nation's economic activity. However it's the economy, that has brought Ukraine close to the brink. And just to be clear, some of Kiev's economic and fiscal problems were visible long before the spat with Russia. Ukraine is now in recession. Deep economic ties with Russia have resulted in painful adjustments in recent months. The nation's exports are down some 19% from last year in dollar terms and expected to fall further. A great example of Ukraine's export challenges is the Antonov aircraft company known for its Soviet era large transport planes as well as other types of aircraft. As the military cooperation with Russia ended, Antonov was in trouble. It had to take a $150 million hit recently by not delivering the medium-range An-148 planes to the Russian Air Force. The Russians will find a replacement for this aircraft, but in the highly competitive global aircraft market, it's far less likely that Antonov will find another client. 4. The most immediate concern however is the nation's currency, which has been trading near record lows in spite of currency controls. In fact Friday's fall in hryvnia was unprecedented (over 11%), as Kiev fails to stem capital outflows. 5. Inflation rate is running above 14% and will spike sharply from here in the next few months if the currency weakness persists. 6. 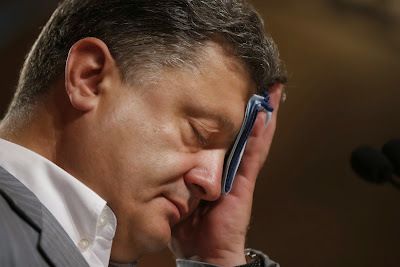 Finally, Ukraine's fiscal situation is unraveling. In its attempts to defend the currency, Kiev has been using up its foreign exchange reserves. It is only the access to some IMF funding that has allowed Ukraine's government to maintain some semblance of order in its FX markets. Fitch Ratings: - Government debt (including guarantees such as NBU liabilities to the IMF) to GDP has quadrupled since 2008, reflecting exchange rate depreciation, fiscal deficits, low growth and below-the-line costs such as recapitalisation of banks and Naftogaz. There is high dollarisation and foreign-currency exposure, making government solvency, banks' balance sheets and the overall economy vulnerable to sharp depreciation. Goldman: - We continue to see downside risks to activity and to our forecast for a contraction of output of 8% this year and for growth of 1% next year. As we recently argued, this severe economic weakness is likely to cause public debt to rise to 70% this year and 77% next year, above the IMF’s “high-risk threshold” for debt sustainability. These downside risks to our forecasts further call into question the sustainability of Ukraine’s debt trajectory.